The all-new, fourth generation Toyota Prius is available to order now and will arrive on UK roads in March 2016, priced from £23,295.Read on for the first details on the equipment specifications and grade line-up. True to Prius’s tradition of being a pathfinder for advanced technologies, the new model combines an improved, more efficient full hybrid powertrain with a number of new safety, comfort and convenience features. It also displays a striking new look inside and out, with sleek exterior lines and a low stance made possible by theToyota New Global Architecture chassis. As well as being technically advanced, stylish and well-equipped, new Prius remains a thoroughly practical car that is easy and enjoyable to drive. Prius has an established role as Toyota’s technology ambassador and the fourth generation model remains true to this tradition, complementing its advanced hybrid powertrain with a range of innovative features for safety, comfort and convenience. Toyota has introduced a new grade line-up for the 2016 Prius, strengthening its appeal for business car drivers with new Business Edition and Business Edition Plus versions. Active and Excel versions are the entry point and top of the range models respectively. All Prius models have LED headlights with Automatic High Beam, electric driver’s seat adjustment, Smart Entry with push-button start and the Toyota Touch 2 multimedia system with touchscreen control and DAB radio reception. An enhanced Toyota Safety Sense package is also standard, as detailed below. A new dual-zone air conditioning system is also standard, equipped with a function that detects whether the front passenger seat is occupied and automatically adjusts air vent opening and air flow accordingly, for more efficient and energy-saving operation. Higher grade models gain more advanced features, such as a colour head-up display (a Toyota first), wireless phone charger, blind spot monitor with rear cross traffic alert, heated front seats and an auto-dimming rear view mirror. New Prius marks the first European appearance of SIPA, Toyota’s new Simple Intelligent Park Assist system. As well as providing automatic steering into a parallel or series parking space, the system can also help the driver exit a tight space. An automatic braking system provides a safeguard against colliding with parked vehicles or obstacles. Toyota Safety Sense provides an integrated package of safety warning and assistance systems on all versions of new Prius, with the addition of two new features. A radar-controlled Adaptive Cruise Control system is included, which automatically keeps the car a safe distance from the vehicle ahead, and the pre-collision warning system is able to detect pedestrians in the car’s path, as well as other vehicles. These are in addition to the Pre-Collision Brake Assist, Autonomous Emergency Braking, Lane Departure Alert, Road Sign Assist and Automatic High Beam. New Prius is available in seven exterior colours, including Hypersonic Red, a new pearlescent shade that offers extra depth and reflective qualities. The interior is available in Cool Grey or Black, with matching trim and cloth upholstery. Leather seats (Excel grade) are in Cool Grey with black shoulder sections, or Black with contrast blue stitching. A number of option packs are available for new Prius to add style, protect the cabin and bodywork and provide extra in-car entertainment. The Parking Pack (£350, Active and Business Edition) equips the car with front and rear parking sensors, while the Protection Pack (£300, all versions), adds front and rear mudflaps, scuff plates, a rear bumper protection plate and a boot liner. Customers can also opt for a Black or Chrome Pack (£350, all versions), which adds rear diffuser, front fog lamp and side sill trims in a piano black or bright chrome finish. A range of integrated rear seat entertainment options is available, including single or twin iPad holders and DVD players. These can be specified for all models in the range. 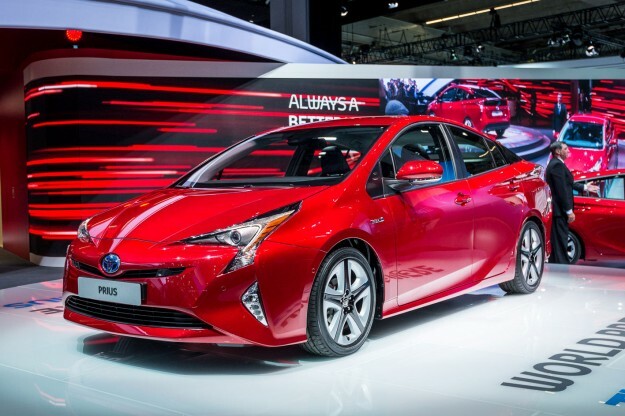 The new Prius is available to order now, with deliveries to customers from 1 March next year. Find out more at toyota.co.uk. See the full Prius price list for the new range below.